Normally I just have a mango smoothie in the mornings… but today I was short on mangoes and had some cherry left over….SOOoooo I had a Mango Cherry Smoothie!! to be honest I didn’t think it was going to be very good!! but WOW I was soooo wrong! It was so delicious.. and I want to have it everyday now!!! so here is how I made it..
**Note: Cherries are one of the very low calorie fruits. Nonetheless, they are rich source of phytonutrients, vitamins, and minerals. Both sweet as well as tart cherries are packed with numerous health benefiting compounds that are essential for wellness.cherries are one of nature’s few sources of melatonin, a hormone that lowers body temperature, making us sleepy. When study volunteers drank an ounce of tart cherry juice concentrate in the morning and again at night, they slept more soundly. they are also small source of zinc; and moderate sources of iron, potassium, and manganese; and good source of copper. Potassium is a heart-healthy mineral; an important component of cell and body fluids that regulate heart rate and blood pressure. Cherries’ abundant supply of antioxidants have been linked to reduced levels of nitric oxide — a compound associated with osteoarthritis and rheumatoid arthritis!!! Put Bananas, Mangoes, Cherries, Chia seeds & sweet drops into your Blender and cover with Cold Coconut water (32Oz) and BLEND for 1 minute. 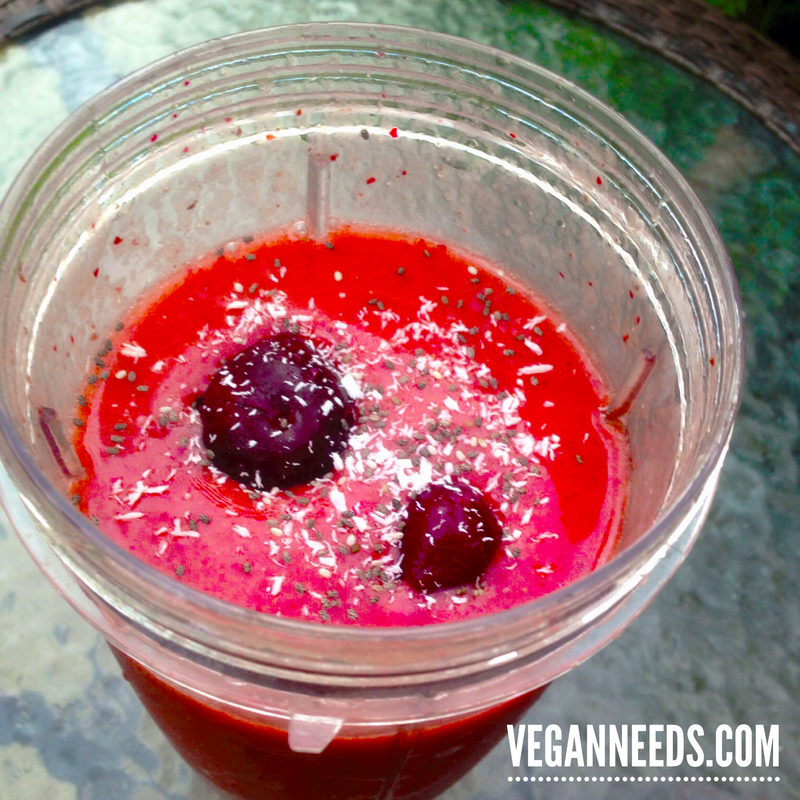 make sure to Blend well, so you do not get cherry bits in there! Previous Cruelty-free but not Vegan Products… what do you think! Next Vegan Needs MysteryBox GIVEAWAY!! !